The Christian Gauss Award: Celebrates outstanding books in the field of literary scholarship or criticism. The Phi Beta Kappa Award for Science: Recognizes superior books by scientists written to illuminate aspects of science for a broad readership. The Ralph Waldo Emerson Award: Honors scholarly studies that contribute significantly to interpretations of the intellectual and cultural condition of humanity. Finalists and award-winning authors are selected by a panel of experts in each category. Award-winning authors will each receive a $10,000 prize at a celebratory dinner event in Washington, D.C. in December 2018. For more information or to attend this dinner please email Jen Horneman. 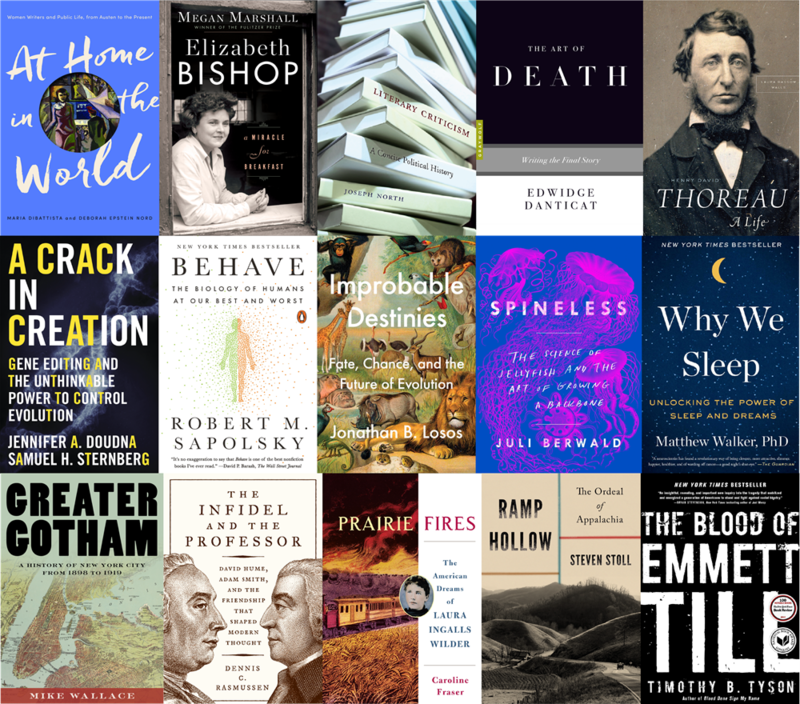 Reviews of Behave: The Biology of Humans at Our Best and Worst and Elizabeth Bishop: A Miracle for Breakfast are featured in the Phi Beta Kappa magazine, The American Scholar. Reviews of At Home in the World, Elizabeth Bishop: A Miracle for Breakfast, Literary Criticism: A Concise Political History, The Art of Death: Writing the Final Story, A Crack in Creation: Gene Editing and the Unthinkable Power to Control Evolution, Behave: The Biology of Humans at Our Best and Worst, Greater Gotham: A History of New York City from 1898 to 1919, Henry David Thoreau: A Life, Ramp Hollow: The Ordeal of Appalachia, The Blood of Emmett Till and Prairie Fires: The American Dreams of Laura Ingalls Wilder are featured in the Phi Beta Kappa publication, The Key Reporter. The Society announced the winners October 1, 2018.